In Newark, they played another exhibition between Hudson rivals. The Devils took this one thanks to Drew Stafford’s tally in a 2-1 home win over the Rangers. He was able to beat Brandon Halverson with a nice wrist shot short side top. Cory Schneider went the distance only allowing one goal. It was a highly competitive game considering the circumstances. You had some rough stuff with the Devils standing up for each other following a couple of illegal hits by the Rangers. None worse than Andrew Desjardins, who caught John Moore with a blind head shot that was a lot worse than it looked live. Moore was okay and went back at him. It led to some four on four before a Devils’ three-minute power play that did little. Desjardins got a match penalty and hurt his chances of making the Rangers. You had your share of penalties. The sides combined for 16 including 13 power plays. Most were ineffective. 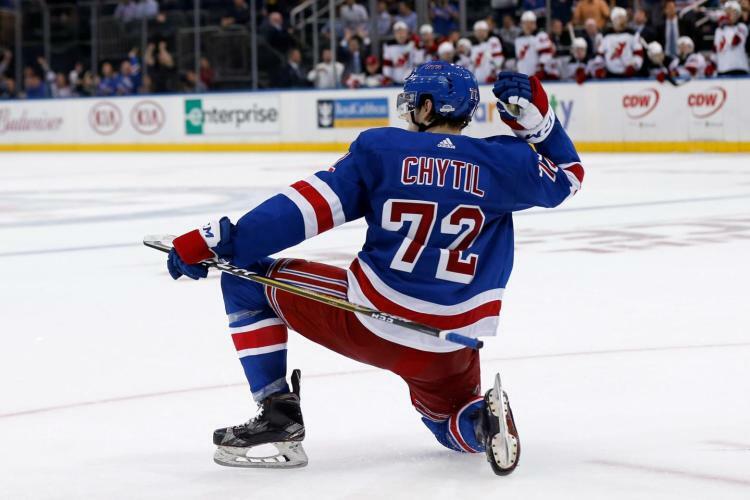 Particularly the Rangers first unit which featured Ryan McDonagh, Kevin Shattenkirk, Chris Kreider, Mats Zuccarello and a ineffective Mika Zibanejad. At least he finally played after the flu kept him out. He’ll need to be better once it starts up for real. I have to give credit to the Devils who did a tremendous job penalty killing. They were very aggressive using improved speed to force the Rangers into sloppy turnovers. They outworked them. That was an area they struggled at under coach John Hynes last year. They also defended better limiting the Rangers to 18 shots. The Devils were better in most facets out-shooting the Rangers 33-18. Henrik Lundqvist went the first two and only was beat once. Joseph Blandisi was able to get to a Adam Henrique rebound in front beating Ryan McDonagh and Marc Staal for a power play goal. It came following a scuffle between Brendan Smith and Jimmy Hayes, who came to the aid of a teammate on a Smith elbow. They gave Smith an extra two even though he threw no punches. Following a successful kill, the Rangers got caught with too many men. That’s when the Devils went to work. John Quenneville worked the puck to Henrique, whose low shot deflected off Staal causing a rebound tha Blandisi potted for the game’s first goal. In the second, five Ranger penalties hurt them. The Devils head a 15-8 edge in shots. Lundqvist performed well stopping 23 of 24. He even played the puck well a couple of times leading to easy clears. The team looked very bland without Filip Chytil. He had a maintenance day. They didn’t dress J.T. Miller, Kevin Hayes or Jimmy Vesey either. Lias Andersson played his third game. He isn’t flashy because that’s not his game. However, you notice him due to his skating and work ethic. I really think Alain Vigneault is giving the mature 19-year old top pick every opportunity to earn a job in a checking role. He’s been used on the penalty kill and even on the power play. It was Andersson who set up Jersey native Brandon Crawley’s power play equalizer in the third through a perfect Rick Nash screen. The kind of play you want to see more of from Nash in what’s hopefully a healthy season where he can prove he is still formidable. The skills are still there along with the willingness to get dirty. He’s so easy to root for. As for Crawley, what a night for the 20-year old overager the club grabbed in the fourth round with pick 123. It was his first game in his home state. He was one of the best Rangers showing good wheels, poise and hockey sense. I wish I coul echo the same for Staal, who just looks done. It’s sad to watch him. Not coincidentally, he was on for both goals against. Not that he was to blame directly. But he’s not looked sharp with the exception of a few penalty kill shifts. I don’t see how they can justify playing him in the top six. Of course, it’s not my call. Neither is Nick Holden, who still has the skating and can do some things offensively. He’s a likely trade candidate if GM Jeff Gorton decides to go in a younger direction. Look at some of these kids they have. The Devils did a good job applying pressure on Halverson, who did a solid job turning aside eight of nine shots. His defense didn’t help him on Stafford’s winner with Smith backing in and Andersson in the wrong position. He should’ve picked up the trailer which I think was Moore. Pavel Zacha made the goal possible by carrying the puck out of trouble and wisely driving the net to create a distraction. I see big things for the second-year center. If he and sizzling first overall pick Nico Hischier deliver, the Devils will be greatly improved. Especially with Kyle Palmieri and Taylor Hall having more help. Plus Henrique. Stafford is a good player. He makes things happen. That looks like a real smart signing by GM Ray Shero, who also was featured in a interview segment between periods. He acknowledged going after Shattenkirk and admitted that he wasn’t a Devils fan but a Ranger fan. But he also talked about taking a shot. That’s all fans can ask for. Will Butcher looks like a keeper. He really could pay dividends in New Jersey. He’s a great skater with a good shot and seems to have an idea in his end. I believe he’ll lead the Devs in scoring among D.
I like the addition of Bryce Salvador between the benches. He gave some good insight and was dressed to the nines. One more point. Boo Nieves really took advantage of his chance in his second appearance. He made things happen on the forecheck and won draws. I think he’s ready. It all depends on the coaching staff. Gabriel Fontaine was also noticeable throughout with his speed. He’s got a future. Thats gonna do it. I’ll try to have something later on cuts. This entry was posted in Devils, NYRangers, preseason and tagged Adam Henrique, Boo Nieves, Brandon Crawley, Brandon Halverson, Cory Schneider, Drew Stafford, Henrik Lundqvist, Joseph Blandisi, Lias Andersson, Marc Staal, Mika Zibanejad, NJDevils, NYRangers, Pavel Zacha, preseason, Will Butcher. Bookmark the permalink.